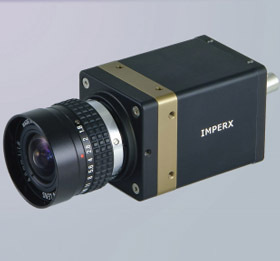 IMPERX ISD-B1320 is an advanced progressive scan, fully programmable CCD camera designed for imaging applications that require high quality images, powerful features and flexibility. The camera is small, light weight, and built around Kodak´s KAI-01150 5.5 micron Interline Transfer CCD image sensor with a 1/2” optical format. The ISD-B1320 provides an image resolution of 1280 x 720 and delivers 50/60 frames per second at full resolution. The camera’s 14 bit internal data image processing engine is based on an industrial grade high-speed, high-density FPGA, enabling a broad standard feature set and easy implementation of demanding custom imaging solutions. The thermally optimized, mechanical and electrical design plus the extended operating temperature range (-40°C to +85°C), and high MTBF of 660,000 hours @ 40C, make this HD-SDI camera a perfect fit for the most demanding industrial, medical, scientific and military applications. This camera is also available with CoaXPress, Camera Link®, or GigE Vision® interfaces.